From beloved author and illustrator Debi Gliori (No Matter What) comes Night Shift, a groundbreaking lushly illustrated picture book based on Gliori's own personal history with depression. 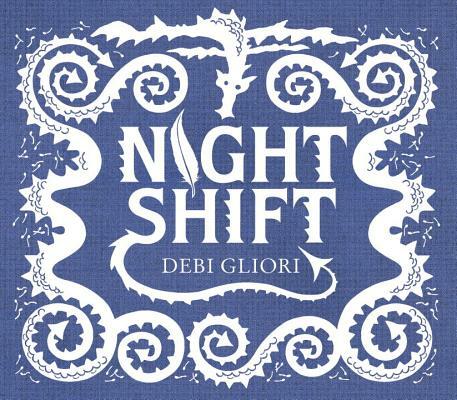 Through stunning black and white illustration and deceptively simple text, author and illustrator Debi Gliori provides a fascinating and absorbing portrait of depression and hope in Night Shift, a moving picture book about a young girl haunted by dragons. The young girl battles the dragons using 'night skills': skills that give her both the ability to survive inside her own darkness and the knowledge that nothing—not even long, dark nights filled with monsters—will last forever. Drawn from Gliori's own experiences and struggles with depression, the book concludes with a moving author's note explaining how depression has affected her and how she continues to cope. Gliori hopes that by sharing her own experience she can help others who suffer from depression, and to find that subtle shift that will show the way out. A brave and powerful book, give Night Shift to dragon fighters young and old, and any reader who needs to know they're not alone. Debi Gliori lives in Scotland. Debi is well known for both her picture books and her novels for children and has been shortlisted for all the major prizes, including the Kate Greenaway Award (twice) and the Scottish Arts Council Award. Debi was the Shetland Islands' first Children's Writer-in-Residence. She has written and illustrated No Matter What, The Trouble With Dragons, Stormy Weather, The Scariest Thing of All, What's the Time, Mr Wolf?, Dragon Loves Penguin and, most recently, Alfie in the Bath and Alfie in the Garden as well as the popular Pure Dead fiction series for older readers. Through stunning black and white illustration and deceptively simple text, Gliori provides a fascinating and absorbing portrait of depression and hope in Night Shift, a moving picture book about a young girl haunted by dragons." "With exquisite brevity, Debi Gliori articulates the struggle of living with depression, in stunning black and white illustrations, punctuated by a single burst of the dragon of depression's fire. The spread where 'something shifted' and the depression lifts, is moving beyond words."